Patrick Makau shrugged off almost two years of injury woes and racing disappointments to win the 68th edition writes Ken Nakamura. His time was two minutes slower than he had predicted but he professed himself happy with his performance. 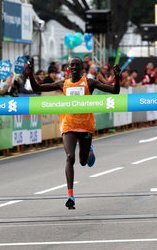 Breaking away from Mongolia's Ser-Od Bat-Ochir at 38km Makau became the fourth successive Kenyan to win the race and recorded his 5th victory in 11 marathon attempts. In excellent conditions, with the temperature at 8°C, 30 runners passed through 5km in 15:16 before the pace picked up to average 3mins/km up to halfway (1:03:37). Pacemakers then dropped out and the remaining runners slowed before local runner Masakazu Fujiwara pushed on at 23km but the leading group was still 20-strong and it was only after 30km (1:31:10) that they broke apart as Bat-Ochir kicked ahead. 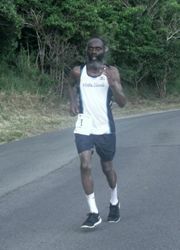 Makau and Raji Assefa had pulled back to him as all three passed 35km in 1:46:23. The persistent Bat-Ochir tried again at 37km, but although momentarily ahead Makau chased and passed him before reaching 40km. Assefa finished strongly to also come past Bat-Ochir who nonetheless posted a personal best and new national record, improving his own mark by 10 seconds. Fujiwara finished fourth and as first Japanese home staked a claim for a place in the Beijing World Championships next summer. Runners from 30 countries participated. Kenneth Mungara, 42 years old, used his experience to show a clean pair of heels to runners 20 years younger. He stayed with the lead group only until 10km before taking off to eventually finish two and a half minutes clear. 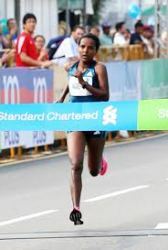 Singapore's hot and humid conditions kept times slow — over five minutes slower than the course record of 2:11:25 set by Luke Kibet in 2008. Mungara also won in 2010, and has won nine of the 15 marathons he has run since 2007 following his late competitive debut in his mid-thirties. Waganesh Amare was only entered at the last moment, as a replacement. She turned up the night before, barely slept due to the 5:00 start, but coped with everything her rivals could throw at her, and then took a minute off them in the final 3km. Haile Gebrselassie had done the rounds as the race ambassador in the previous few days, and found conditions in the 10km too hot — and humid — to handle. As the temperature topped 30°C he lost out in the final stages to the Kenyan pair of Solomon Keter and Thomas Maritim. 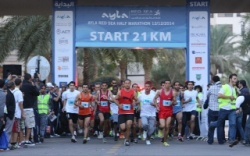 Over 2000 runners converged on the southern Jordanian city of Aqaba for the Half Marathon and associated 10km and 4.2km kids race. the event is attracting an ever-increasing number of foreign tourist-runners keen to experience the many nearby attractions that include the ancient city of Petra, the tranquil wind-carved beauty of Wadi Rum with its connections to Lawrence of Arabia, Red Sea diving and more within the highly stable and secure borders of Jordan. Defending champion, Ra'fat Zboun used cool running conditions to best effect on the flat fast course, opening up a lead of 500m over Ayman Suradi. Bashar Raheel ensured a domestic clean sweep. Sudan's Hanouya Hasballah completely dominated the women's race, leaving her nearest contender 20 minutes behind. "We are proud of the success the marathon has achieved in organization, participation and media coverage. The Marathon will continue to spread the message of a healthy lifestyle and the art of volunteering," confirmed HRH Princess Dana Feras, who deputized for HRH Prince Feras Bin Raed, the chair of the Run Jordan Board. Over the past four years the event has initiated an awareness and participation in road running. Most growth has been in the 10km, with the first 7km run through the idyllic new Ayla Golf and Residential resort. On this tough course, in hot and humid conditions, 62-year old two-time Olympic marathon runner Calvin Dallas showed how it's done. Early on three runners were stride-for-stride over one of the most scenic and historic pieces of geography one will find anywhere. After reaching to the easternmost point of the course with St. Thomas, St. John and British Virgin Islands as a backdrop to the north, Dallas and Ben Appleyard were still together, but Dallas then forged ahead to defend his title. Bridget Klein also successfully defended in the women's race, finishing fourth overall. Last year a few from the "50 States Club" ran the race; this year it was representatives of "Marathon Globetrotters": 62 year old Robert Bishton and 65-year old Rich Holmes did private battle, with Bishton prevailing. 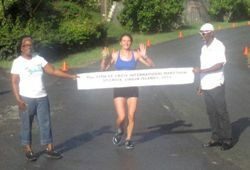 The 40th Virgin Islands Half-Marathon attracted the fastest road runners in the Virgin Islands. Juan Robles successfully defended his title, and women's winner Ruth Ann David ran Shane Degannis close for overall second place.